Tag Archive | "Mosquito Rasbora"
The Mosquito Rasbora (Boraras brigittae) is found in dimly lit, slow moving, quiet blackwater streams and ponds in the forest peat swamps of South West Borneo, Indonesia. The Mosquito Rasbora has a distinctive color and pattern. They have a reddish background body color with a black/dark brown mid lateral stripe and a blotch at the base of the caudal fin. Because of their small size, Mosquito rasboras are best kept in small groups of at least 8 to 10 specimens in a single species tank. 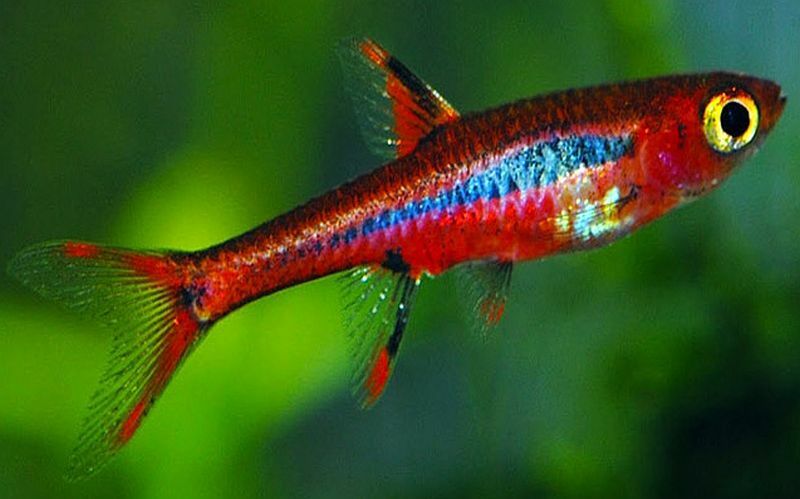 If introduced to a community tank, they should have like sized tank mates like Tetras, Trigonstigma rasbora species, dwarf cory species, dwarf loach species, Dario dario, or some of the smaller cyprinid species. Although Mosquito Rasboras are tolerant of a wide range of narrow water parameters, they should never be used to cycle an aquarium. Like most species, sudden swings in the water parameters can have a detrimental effect on the health of these fish. A densely planted aquarium with a sandy or fine gravel substrate with some driftwood and floating plants makes an ideal environment for Mosquito rasboras. Adding some leaf litter to the tank and allowing it to break down over a period of several weeks will provide the fish with naturally occurring algal colonies that can supplement their diet. Mosquito Rasboras prefer low light conditions, so use plants like Java Fern that thrive in low lighting to decorate the aquarium. A minimal water flow is sufficient for these rasboras, however they do require regular water changes to keep the water quality up. 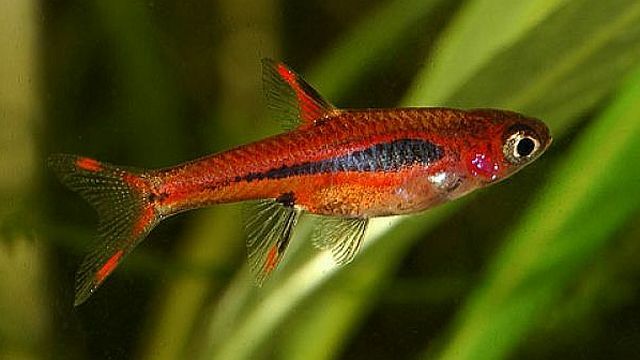 Mosquito rasboras are egg scatterers and will usually spawn in an established well planted aquarium with soft, acidic water, without any additional help. The males are more brightly colored, are slimmer, and slightly smaller than the females. They will lay a few eggs every day for several days until spawning is completed. If you plan on keeping any of the fry to adulthood, remove the parents after the second day of spawning. After the first batch of eggs hatch out (in a couple of days) the fry will be free swimming approximately 24 hours later. Because of their continuous spawning activity, one pair of Mosquito Rasboras can produce several batches of eggs for the tropical fish keeping enthusiast to care for. Several small tanks with seeded, fine pore sponge filters can be used to keep the water clean for the eggs and fry as they hatch. The fry should be fed infusoria after they absorb their eggs sacs, and finely crushed flake food, daphnia, or baby brine shrimp as they grow out. In their natural environment, Boraras brigittae feeds on insects, small crustaceans, and zoo plankton. They readily accept live, frozen or freeze dried daphnia , brine shrimp , mosquito larvae, and quality commercially prepared foods. Mosquito rasboras are not a common item in tropical fish shops and are sold when they are 3/4″ to 1″ in size.